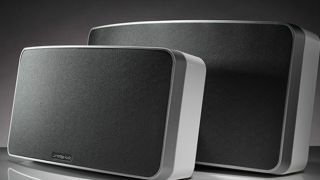 Cambridge Audio has priced and released its latest AirPlay and Bluetooth-enabled speaker systems, called Minx Air. Launched in December, the Cambridge Audio Minx Air 100 and 200 speakers will enable users to stream music to the powerful single units from most mobile devices. The Minx Air 100, priced at £329, offers 100 watts of power, while the pricier, £429 Minx Air 200 model will bring users 200 watts. The smaller Minx Air 100 model features two BMR (Balanced Mode Radiator) drivers, while the Minx Air 200 also adds a 6-inch subwoofer into the mix. The speaker systems also have a Minx Air companion app, which allows users to access over 20,000 internet radio stations, as well as controlling volume and EQ settings. The company is also touting the ability to stream audio from YouTube, Last.fm, Spotify and a number of other apps. Users will also be able to hook them up to a TV or Blu-ray player. The Minx 100 and Minx 200 are available to buy from Richer Sounds or the Cambridge Audio website.